At Walnut Ridge Cabinetry, we are completely dedicated to our customers by delivering quality cabinetry products at an affordable price. We stock seven unique lines of kitchen cabinetry to compliment any style or decor from traditional to modern and everything in-between. All Walnut Ridge Cabinetry products are quality-built with all-wood materials, durable finishes, and sturdy construction. Most cabinet styles feature adjustable shelving, six-way concealed adjustable door hinges, dovetail drawer boxes and full extension drawer glides. Pantry cabinets, oven cabinets, coordinating trims, easy upgrade options, and a full line of accessories are available in each of our cabinet collections. View our Kitchen Cabinets Page to see all of our cabinetry options. 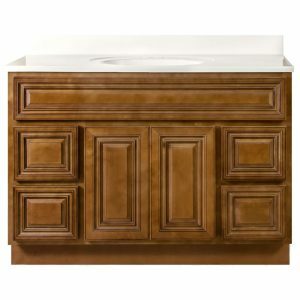 Walnut Ridge Cabinetry offers an exclusive line of designer furniture-style bathroom vanities. Our selection includes five unique vanity styles to provide the perfect finishing touch to any bathroom. The elegant design of our furniture vanities features soft-closing door hinges, full-extension drawer glides, and dovetail drawer boxes. Sets include vanities in a variety of size options, mirrors, and linen cabinets. All five of these collections have a furniture-quality finish. Coordinating fillers are also available for all furniture bathroom vanity styles. Visit our Bathroom Vanities Page to learn more. At Walnut Ridge Cabinetry, we stock high-quality cabinet-style vanities that coordinate with our kitchen cabinet lines as well as Glossy White and Empress style vanities. Our cabinet vanity selection includes nine different style options that offer the same great features as our kitchen cabinet lines. Vanities, mirrors, linen cabinets, and additional accessories are available for most cabinet vanity collections. See our Bathroom Vanities Page for more details.